Azienda Agricola Unterortl was established in 1992 in Alto Adige, Val Venosta, in the Northern tip of Italy close to the boarder of Austria. Located about 750m up on Juval Hill, they make only 30,000 bottles per year from around 4ha. According to the May 2009 issue of Decanter magazine, Martin Aurich of Unterortl is one of Italy’s stars of tomorrow, and is producing one of Italy’s finest Rieslings. Aurich was born and raised in Germany and studied oenology in the 1980’s. Aurich says “Unterortl’s proximity to the glaciers gives the wines their high acidity and freshness. The well-draining granite and sand is similar to Wachau in Austria”. Aurich vinifies as naturally as possible. 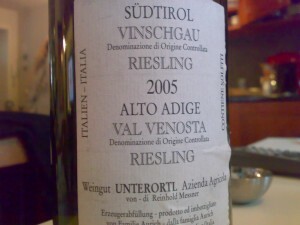 Appearance: A light golden yellow with high intensity indicating high acidity. A bit darker than I expected. Looked like a warmer climate Riesling, which would indicate that 2005 was a warm vintage in the area. Nose: At first, the aromas reminded me a lot of wines from the Pfalz in Germany, in particular, Bürklin-Wolf. Ripe lemons, very light petrol and minerality. Some fruity notes, seemed to have lactic aromas suggesting that perhaps this wine went through malo-lactic fermentation. I could not find any information validating this, but it’s just a hunch of mine. Palate: Dry but fruity, with high acidity. Medium alcohol which was slightly apparent on the palate. Ripe lemons, but slightly lacking fruit in my opinion. Quite rounded with good acidity, but not terribly focused and lacking some freshness. A slightly fat Riesling. 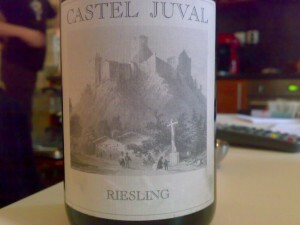 In my opinion, this was a pretty good Riesling, but not great. I believe I paid around 14 euro and I feel that it was a decent value at that level. I didn’t hate it, but I didn’t love it either. If I had another bottle, I think it would be interesting to taste it again in about 5 years. I believe this will age well and actually improve.